Now that it’s summer, you want to head out to sea. It’s time to explore the windswept islands that are only really open during these few precious months. Over the years, you’ve fallen in love with Washington’s San Juan Islands and all of the islands in Maine’s Penobscot Bay. You’ve explored the Orkney Islands off the north coast of Scotland and Norway’s Lofoten Islands. While the remote Faroe Islands are a recent favorite. So where to this summer? How about France’s northwesternmost point? Ile d’Ouessant lies 30 kilometers off the coast of Brittany. It’s at the southwestern end of both the English Channel and the Celtic Sea. It looks like it belongs on the coast of Ireland. Rolling green hills are dotted with stone cottages and even older stone walls, tiny chapels and lots of sheep. Lighthouses, sharp rocks, and small beaches line the coast, which is continuously battered by waves. Countless shipwrecks are just offshore. It’s nicknamed “the island of women,” for the women who live on their own while their fishermen husbands are out to sea. It feels like the end of the world. You arrive at Port du Stiff on a ferry from Le Conquet. Though it’s only a 15-minute flight from Brest, you prefer to taste the salty air and watch the seagulls circle above as you approach the little island. From the port, you catch a shuttle to Lampaul, the only real village. From there, you can hike or bike your way around more than 45 kilometers worth of wildflower-lined trails. Small, rare Ouessant sheep—which were once everywhere in Northern Europe—are never far from sight. The Creac’h Lighthouse is your first stop. The black-and-white-striped lighthouse, at the west end of the island, is known as one of the most powerful lights in the world. It needs to be. Ships entering the English Channel can see its white flashes up to 60 kilometers away. It’s saved many lives since it was built in 1695. You visit the Musée des Phares et des Balises, the island’s main museum, at the base of the lighthouse and the nearby cemetery, where small wax crosses mark the graves of unknown sailors. You walk along a rocky beach. Since dangerous currents deter swimmers, it’s empty save for some Siberian birds nesting in the dunes. For the moment, the winds are calm, the water looks turquoise, and you have a gorgeous spot all to yourself. You have one more stop to make before reboarding the ferry. 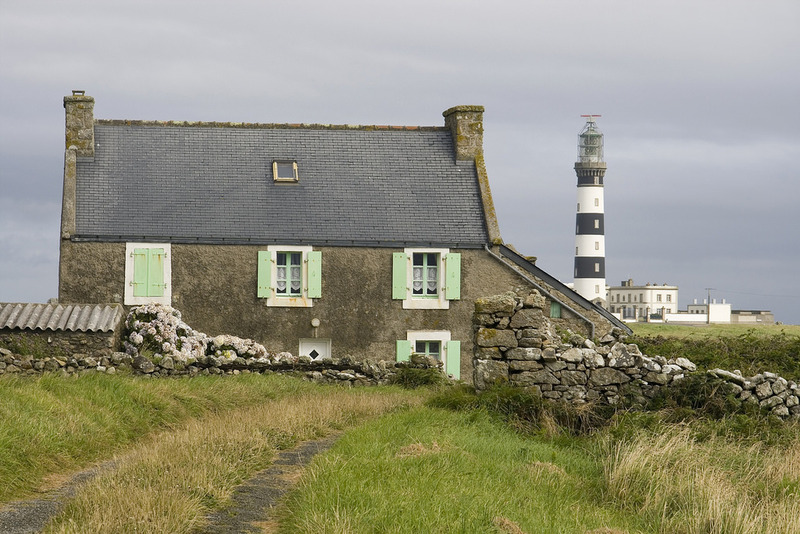 Ile d’Ouessant is known for both its crêpes and its seafood. You go back and forth between the two as you return to Lampaul. Ultimately, since you’re on an island, you can’t pass up the seafood. You head to Ty Korn for a Breton black wheat beer at the ground floor pub and then a huge seafood platter at the restaurant upstairs. Though full, you’re talked into their famous tiramisu breton—made with apples, mascarpone cheese, and salty caramel sauce—as well. All you need now is a cute boutique hotel with a sea view. If there were one, you could easily see yourself spending the rest of the summer on this little French island.